Every time Colby or I come home or if we have company over our yellow lab, Archer, turns into a Jack Russell Terrier at the front door. He gets really excited and jumps straight up landing on whatever or whoever is below him (usually it’s poor Stetson). We wanted to break Archer of this habit, so Colby signed us up for the “Door Manners” class. It was a one-time class on a Saturday afternoon. Two other dogs were in the class with Archer and I, so we received a lot of individual attention. The instructor was awesome and walked us through her Think-Plan-Do strategy. The first thing we did was figure out what was the undesirable behavior that we wanted to fix. For Archer we focused on his jumping when people come to the front door. Most of the time the undesirable behavior is encouraged by our interaction with our dog. For example, when Archer jumps I would often make eye contact with him telling him to stop or guests would push him off of them. We, as humans, see this is as trying to cure him of his jumping by telling him it’s the wrong behavior, but as a dog he may see the eye contact and the physical contact as positive reinforcement and attention prompting him to do it again and again and again. We also looked at the undesirable behavior from a safety perspective. Could anyone (or any animal) get hurt from Archer jumping? If Archer were to jump on a child or an elderly adult he could definitely hurt them, cause them to fall or at the very least scare them. He has scratched my legs multiple times and he could also injure himself or the other dogs if he were to land awkwardly. What is going to be our end goal? Not jumping (obviously), but how will we get Archer to not do it? With the help of our instructor we decided when company comes over our goal is to have him “go to his mat” (a down-stay on a predetermined dog bed, blanket, towel, or mat) till we say it’s okay for him to get up and calmly greet everyone. So what do we do to help cure Archer of his Jack Russell tendencies? 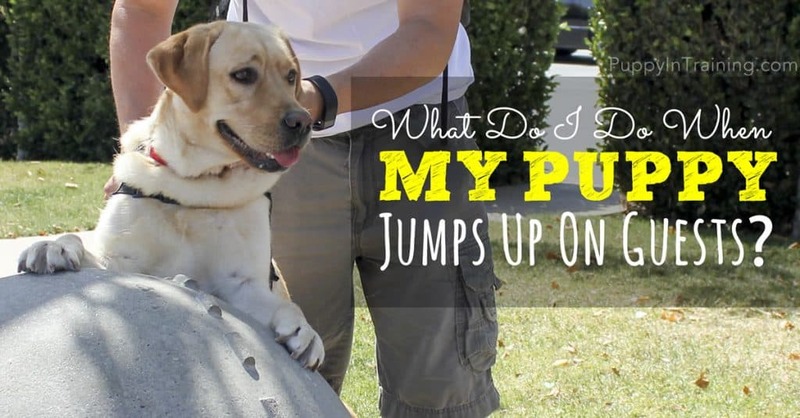 What should you do to stop your puppy from jumping up? Think-Plan-Do! Archer isn’t going to stop jumping immediately. It’s going to take a lot of time, patience, and practice to get him to our end goal. Until we get to our desired behavior of having him “go to his mat” when company comes over, we have to have a backup plan. Distance and restraint is key for Archer in the days (or weeks…or months) leading up to his “perfect” door manners. Having Archer a healthy distance away from the humans so he can’t jump on people or having him on a tie-down or a leash will help alleviate the problem until we are able to perfect it. Having an immediate plan is especially important if safety is an issue with your undesirable behavior. Duration – So…how do we go about training Archer to not jump? We need to start from square one. Fortunately Archer knows his “go to your mat” command from his obedience classes, so our first steps are to add duration, distance, and eventually distractions. We had Archer “go to his mat” and would treat him for staying there for one second, then two seconds, then back to one second, then three seconds, etc. and would hopefully build up to 20 seconds. The instructor made it clear that if you try to push your dog too hard, too quickly (i.e. trying to get them to down-stay for 10 seconds on their first try) it could reinforce the negative behavior of them getting up off the mat, so start slow and make sure your dog is successful. If they start to get up off their mat, go back and treat them for staying for one second. 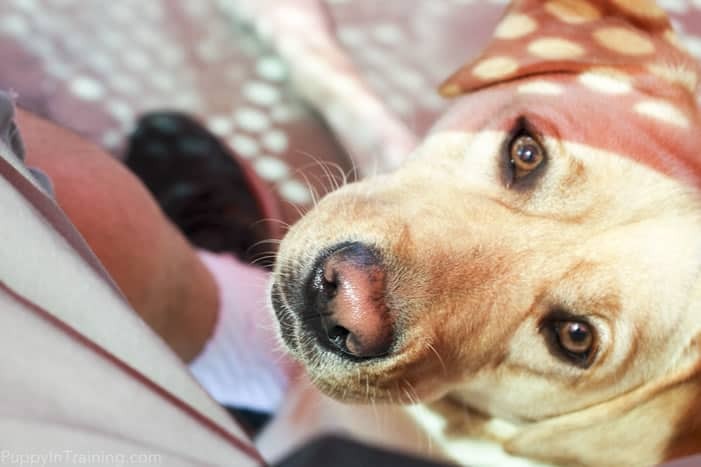 Distance – Same goes with distance: start close to your dog and treat him for his down-stay, move one step back and treat, move two steps back and treat, and then alter your distances always making sure your dog is successful. I usually stand in front of Archer and step backwards when practicing distance, but I have to remember to step to the right and left and stand to the side of him to vary our training. Distraction – Lastly, once Archer’s duration and distance is mastered, we will add in distractions. Distractions come in all shapes and sizes. From noise distractions (clapping, knocking on a wall/door, talking, yelling, and eventually a door bell), motion distractions (people walking/running by, toys rolling around, humans sitting down/standing up, jumping jacks, etc. ), dog distractions (having other dogs around, dogs playing, barking), and out-of-sight distractions (removing myself from Archer’s line of sight for an amount of time). Again, the key is to not introduce too much too quickly to your dog: one small distraction at a time. And if it seems to be too much excitement, you could also put the distraction farther away from your dog to help keep his focus on you and staying on his mat. Once we have distractions conquered, we can work on having people come over and having Archer “go to his mat”. To start we may have the mat far away from the door (or maybe in another room if necessary) to help with the excitement of running up to the person and then gradually bringing the mat to it’s permanent spot in the house (yet to be determined). All right…so it’s time to start implementing everything! Archer is currently working on the beginning stages of distractions with the help of Linus, Stetson and Raven. Dog distractions are his Achilles heel because of his strong urge to play, so this is his hardest test. Hopefully in the coming weeks or months we will be able to report on Archer’s progress. I’m crossing my fingers we’ll be talking about how he goes to his mat when company comes over and doesn’t jump on us or our guests. Until then…we keep practicing. Here are some more tips from ThatMutt.com on how to stop your dog from jumping up on people. How about you guys? Does your dog jump up on you or your guests? 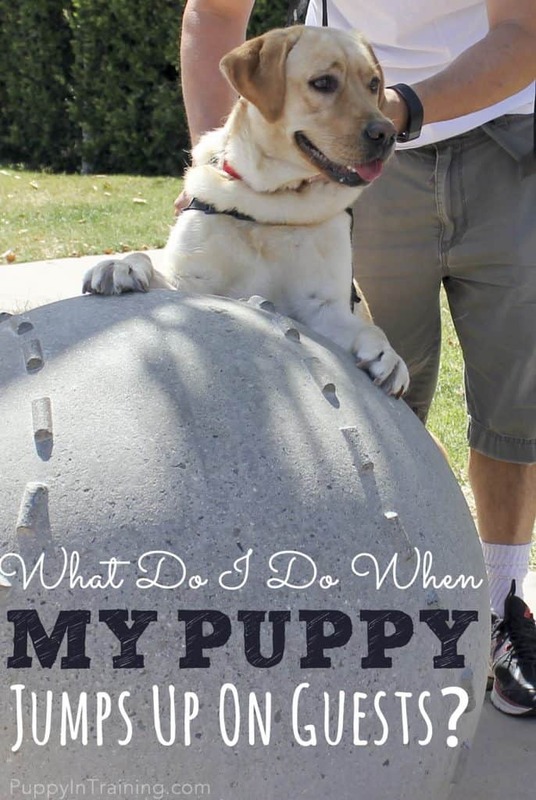 Do you have a plan for training your dog? Tell us about your dog in the comment section below. This post was written by my wonderful wife Ali. Ali has been raising and training guide and service dog puppies with me since 2011. What do you do when your puppy jumps up on guests?